For over 5 minutes Brian was held at taserpoint (new word I guess) and still owns Sgt. Andy Murcado by asking, at first, questions about his detainment. Like, “Am I being detained?” or “What crime am I suspected of?” Naturally when Sgt. Andy Murcado fails to provide a reasonable answer Brian becomes more frustrated and calls the officer a “pig” and points out how this is what a police state looks like. The entire time Sgt. Andy Murcado is getting his tongue lashing from Brian he’s stating that he’s resisting arrest, which is ridiculous, since it hasn’t been explained to him what he’s being detained for in the first place, but also because he’s not doing anything. He’s just standing there. Ultimately, Brian was taken into custody, charged with ‘making threatening gestures’ and resisting arrest, by the thuggish cops. The reason why Brian just released this footage is because his public defender, in another case, told him the charges where dropped. Yet, no one informed Brian so that he could obtain his property back. What a colossal waste of time huh? Part of the problem with making it a common practice to NOT hire people who do well on an IQ test is that you end up with a nearly endless list of stupid people on the police roster. Take these 3 testaments to the existence of Neanderthals, Sgt. Andy Mercado, Officer Dave Garza and Officer Tweena Dum of the Fresno police department. All three just graduated with honors in how not to behave toward the public and acing Assholery in public. The solution to the hubris of the dastardly reprobate with a badge is to bust him down to a janitor. He has no business with a badge and a gun. For far too long police have behaved like a gang rather than the servants that they are. If they are going to be given the trust of the public, when they break that trust by arresting innocent people for imaginary crimes, they must be fired. 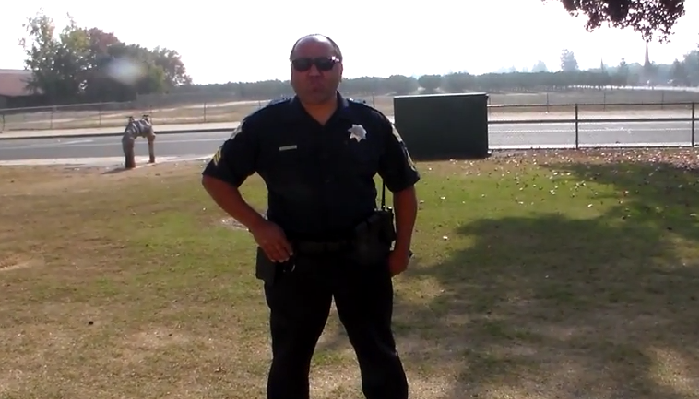 While waiting for a friend in Rotary park on the corner of Cedar and Sierra, I was accosted by Fresno Police Sgt. Andy Murcado. I asked if I was being detained. Sgt. Andy Murcado claimed that I was detained for making a threatening gesture or causing a disturbance. A female officer joined Sgt. Andy Mercado, and began to talk to my friend. Sgt. Andy Murcado attempts to convince me to stop recording, and voluntarily surrender to police custody because now I’m resisting arrest. When asked what crime I committed to be arrested for, Sgt. Murcado again fails to clearly articulate, and mumbles a sentence about resisting arrest. This entire time this conversation is happening Sgt. Andy Murcado is holding me hostage with a taser, and eventually with the help of 2 other officers forces me to submit to arrest and I was placed in cuffs, and transported to the jail for processing.